Friday, March 22, 2019, We will hold our annual fundraising event to raise money for, and awareness of, local food assistance programs. For your donation and attendence, you will gain some insight into the efforts being made locally to help feed people in our community. You will be able to sample soups from local resturants who help us in this endevour and you will take home a commorative bowl contibuted by local artists supporting our goals. We thank all the restaurants, musicians, artists and volunteers who make this event a success. The Empty Bowls Project was initiated by a Michigan art teacher in 1990 as a way to raise charitable funds for his community. His idea spread, and Empty Bowls events now take place across the United States and in at least a dozen other countries. Millions of dollars have been raised and donated to hunger-fighting organizations. 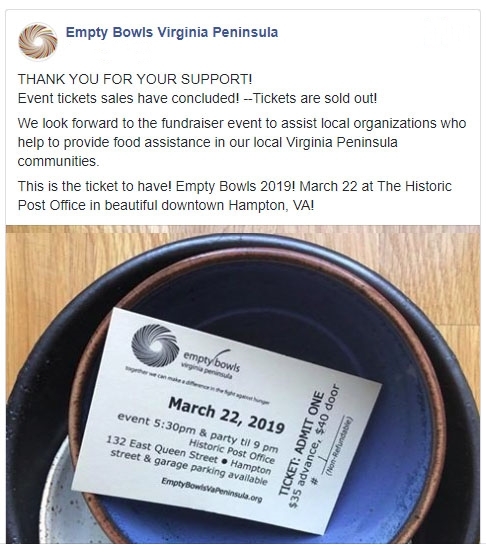 Empty Bowls Virginia Peninsula is engaged in a grassroots effort to raise both money and awareness in the fight against hunger in our local communities. The Empty Bowls Project is an international grassroots effort to raise both money and awareness in the fight against hunger. Our 2019 Fundraising Event will be held at the Historic Post Office in Hampton. In 1914, the post office was Hampton’s center for conveying the community’s everyday stories. Letters from all over the world passed through these doors. In 2014, a video production company was able to carry on the tradition by bringing real-life stories, produced at the Post Office, to people internationally. Now, the Historic Post Office continues to bring people together as a wedding and meeting venue and as a place for the community to gather by hosting things like the Empty Bowls Event. Join us for a beautiful evening in this historic location.